A team from Lancaster Baptist Church and I, along with a few other pastors, were able to participate in the twenty-seventh annual Pastors’ Conference at the Ilo Ilo Baptist Church in the Philippines, September 19-21. The trip began with a layover in Seoul, Korea, that included two hours of training for pastors as well as a wonderful service at the Bible Baptist Church. A good number of pastors were in attendance for the training sessions at which I was privileged to speak. We were able to encourage those present to continue reaching out for souls and developing a strong missions program. The message emphasized the importance of maintaining strong conviction while doing the work of the Lord. On Wednesday morning the group traveled to Ilo Ilo and was greeted by monsoon rains! Dr. Rick Martin and his church family did a wonderful job hosting the conference. There were a number of missionaries and a few other churches from the United States represented. 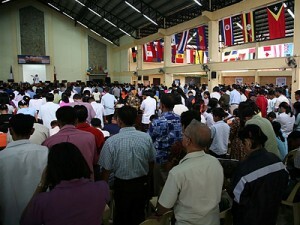 The primary purpose of this conference was for the eight hundred plus senior pastors who came to receive training. I preached on Wednesday night a message entitled “Stephen, a Man Full of Faith and Full of the Holy Ghost.” On Thursday, other pastors and I conducted training sessions. I preached a message on seven principles for building a team concept within the local church. The premise of this lesson was: “Strong convictions precede great actions.” I challenged the pastors to remain strong in their convictions in order that they might do great things for the Lord Jesus Christ. The meeting concluded on Thursday evening as I preached a message, challenging the pastors and Christian workers to build strong soulwinning churches in their cities. Despite torrential rains, several thousand people sat with tremendous attentiveness to hear the preaching of God’s Word for many hours throughout the conference. It was truly humbling to see the dedication and desire on the parts of the Filipino Christians! One of the great highlights of the trip was for the group to meet Brother Clark and Rachel Graham. Clark and Rachel are graduates of West Coast Baptist College and Brother Clark grew up at Lancaster Baptist Church. 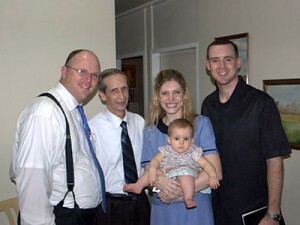 Along with their children, Charlie and Shannon, they are serving the Lord there in Ilo Ilo with Brother Rick Martin. Brother Clark’s father, Curtis Graham, was also able to be a participant on the trip. 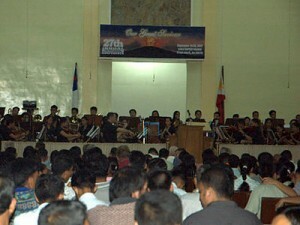 Lancaster Baptist Church supports over 170 missionaries. 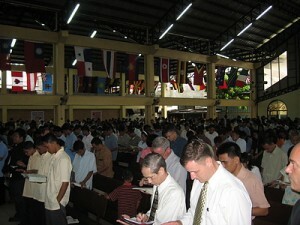 Presently, the church supports more missionaries to the Philippines than any other field. We recognize the great opportunity to reach souls for the Gospel in this open area, and the church family is happy to be involved in supporting these wonderful missionaries. Training national missionaries has been one of my passions for several years. I have conducted Spiritual Leadership Conferences in Asia and I count many of these pastors as dear friends and co-laborers for the Gospel ministry. 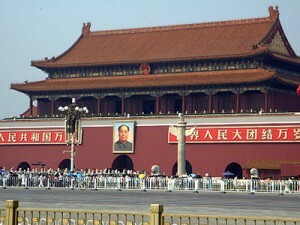 As the group traveled home, the final layover was in Beijing, China. During our brief stay in Beijing, we were able to meet with a number of American missionaries and Christian servants who are serving in China. Two of the men who are working with house churches had police officers in their services the previous Sunday telling them to disband their services. While many thought the Chinese would be less active in hindering the works of Christian ministry in China prior to the Olympics, it seems just the opposite is coming to pass. The missionaries with whom we met seemed very concerned about this pattern. Another one of the highlights of the time in China was meeting a Christian business man whom I was able to lead to Christ, personally, several years ago here in Lancaster. He was able to host the group and provide a meeting space where I shared in a time of prayer and devotions with a good number of Christian workers. Please pray for these who labor to share the Gospel in the needy land of China. On Saturday, our group flew home and was able to arrive in Los Angeles that same evening and be present for church services on Sunday. We believe missions is truly the heart of God and it is a special joy to encourage missionaries as they labor for the Lord!